The adze was a carpenters tool used for cutting wooden statues etc. It was used during the Ceremony of the Opening of the Mouth. In this ritual the funerary priest would come to the mummy, the statues and wall paintings and he would touch the figures on the mouth. This action was believed to bring the figure to life and would be activated and ready to act on behalf of the deceased. The double lion god, gaurdian of the sunrise and sunset. Gaurdian of the peaks that supported the sky. The western peak was called Manu, while the eastern peak was called Bakhu. The Akh is the last element of the ‘body of man’, and is perhaps the most difficult concept to explain. This is shown in hieroglyphs as a bird. The akh is a supernatural dynamic force that is present in the universe that can be plugged into. The akh provided the means to partake in the universal life force. The akh could be utilised by both the living and the dead. The season of inundation in the ancient Egyptian calendar. The first of the three seasons, each season consisted of 4 months each with 30 days. Akhet also co-incided with the rising of Sirius, which signalled the arrival of the Nile floods. In ancient times this season began around the 19th July according to modern dates. Magical symbols were thought to bring the wearer health and good luck. From the Arabic hamulet meaning ‘something carried or worn’ and commonly worn around the neck. Which would be worn or carried to bring good luck, or to help with a particular problem. Some shapes were generally potent, while others were more potent. They were provided to give power to the deceased in the tomb in which they were placed. The animal amulets may have been there to provide a food supply, the figurines would come to life using magic, others were animals that were strong or cunning and may have been used to improve the prowess of the deceased in hunting in the afterlife. The female figurines found in the graves of both male and female are thought to represent a major mother goddess, which we no longer know the name of. Women may have used them as requests for children or pleas to the mother goddess to be reborn in the next world. Other figures are also found in the grave, which are also connected with birth, for example hippopotamus’s, which was a symbol of fertility and rebirth; there are also cattle on trays, which were either a magical source of food or to ensure the fertility of the herds. The Apis Bull was sacred to Osiris. It was revered from the earliest times, through the Graeco-Roman period. The two first Dynasties of Egypt are called by archaeologists and Egyptologists, the 'Archaic Period' (further reading WB Emery – Archaic Egypt). 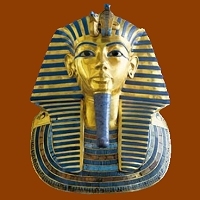 The atef crown was worn by Osiris. It is made up of the white crown of Upper Egypt and the red feathers are representative of Busiris, Osiris's cult center in the Delta.